This week I made a vow not to buy an groceries. I have so many other things in my pantry and fridge that it was starting to get ridiculous how much I'd buy on top of the things I already had. This past summer, my sister gave me some quinoa and the first time I tried to make it, it was awful. Maybe the heat was too high or I didn't cook it long enough, but at that point I decided that quinoa and I were not meant to be friends. Enter this week's resolution. 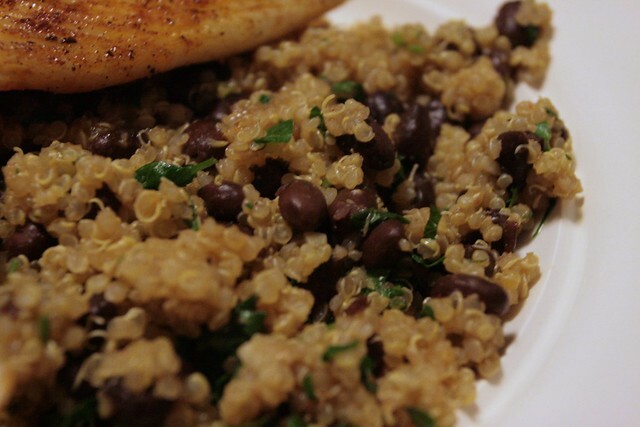 In an effort to try to use what I have rather than wasting it, I gave quinoa another chance. Much like the time I made pancakes for one, I searched for quinoa for one, and this amazing recipe showed up (even though it says it serves 10!). The quinoa comes out at the perfect consistency! I can't wait to make this again. In a medium pot, heat olive oil and brown garlic. Add quinoa and toast for 30 seconds, stirring. Add broth and spices, bringing everything to a boil. Once boiling, reduce heat to medium-low and cover for 20 minutes. Fluff with a fork and add beans, parsley and lemon juice. 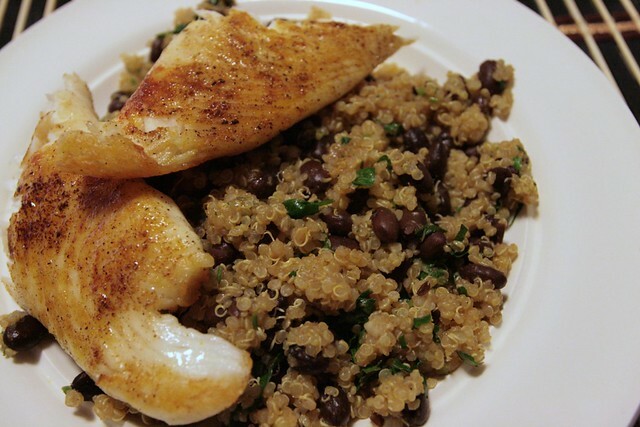 * Serve as a main course or side dish (I had mine with paprika-seasoned tilapia). *This recipe is really flexible. I didn't use an onion as the original recipe called for because I didn't have any with me, but you can probably add lots of other vegetables and spices. It's so delicious!